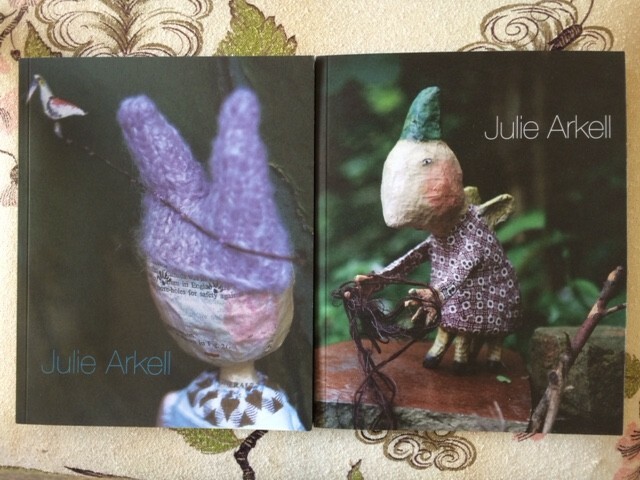 Julie Arkell has been a friend of the shop for many years, so of course we had to include her in our anniversary book! 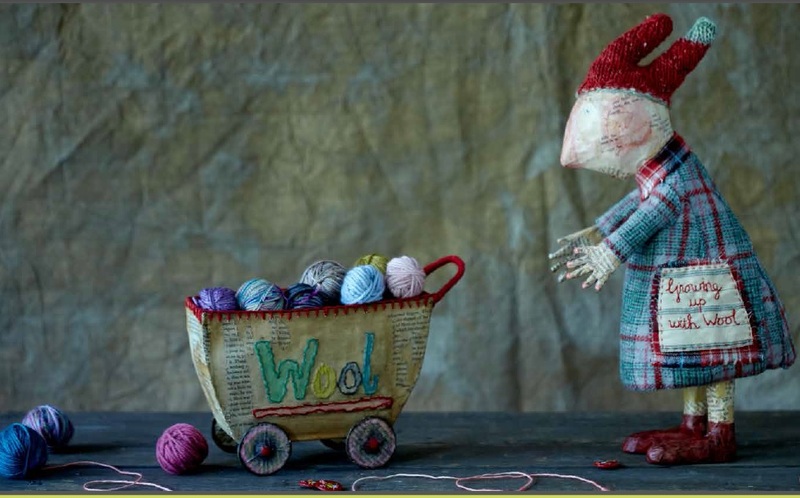 You have most likely seen Julie’s work in the shop – her whimsical creatures constructed using papier-mâché, fabric, wool and found objects. Julie lives in Islington, so back in 2005 she was very excited to hear that a wool shop was to open on Cross Street. She managed to spot Susan in the shop a week before it opened and after chatting together, well the rest is history! As well as regularly visiting Loop for materials, “I have knitted all sorts of things for my work- shadows, paths, fields, ponds- as well as clothes and accessories for the creatures”, Julie has held countless Creature Workshops at the shop. 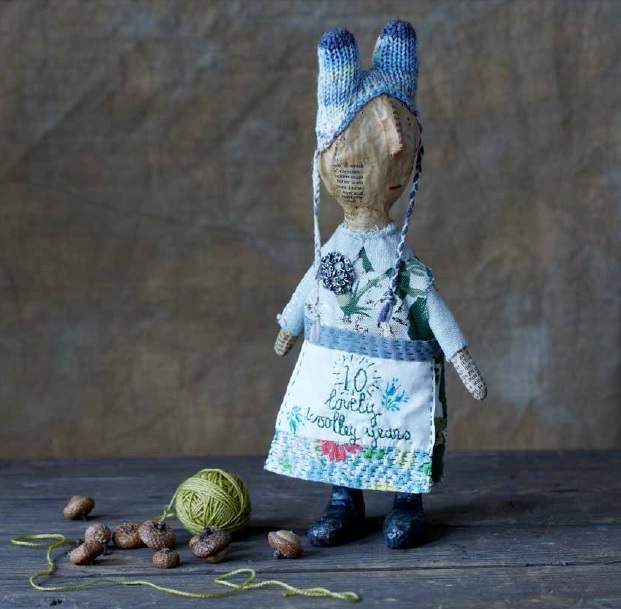 In these, Julie has prepared a papier-mâché figure and participants spend the day with her, crafting with textiles and wool to dress their own little folk. Little details of embroidered phrases or word capture each ones character and story. For her contribution to Loop’s 10, we have an inspiring introduction in the form of a little essay entitled ‘The Wool Shop’“…so thankful Susan opened Loop 10 years ago, it has changed my knitting ways!”. Julie also features in the book in another way. You may recall our interview with Rachel Atkinson in an earlier post where she explains the inspiration behind one of her designs was in fact Julie. 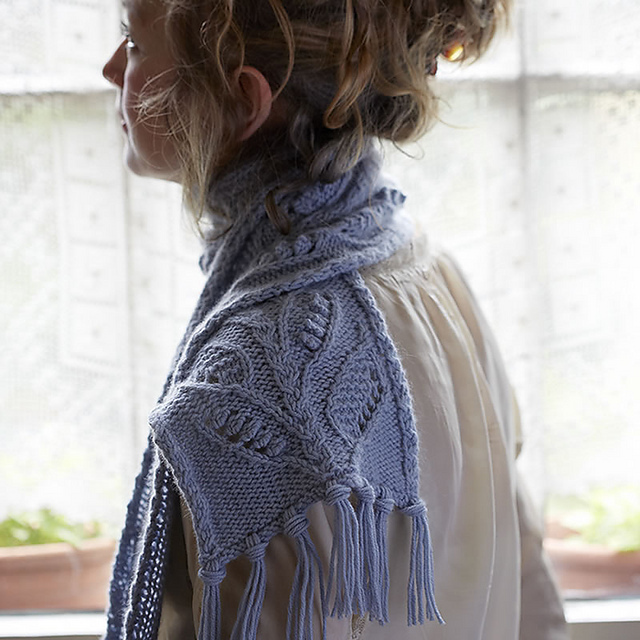 This cosy textured scarf is as lovely as its namesake, knit in the super soft Jade Sapphire 8ply Cashmere and our custom colour ‘Cloud Cuckoo’. Her work often graces the shelves and window displays at Loop, but there is one very special one that Julie made especially for us. She’s now smartly dressed in a very appropriate 10th Anniversary apron! Head to our instagram account LoopLondonLoves and follow the instructions detailed on our Julie Arkell post. This competition will close on Wednesday 27th August at midnight and the winner will be chosen at random and announced on next weeks blog post – Good Luck! Of course we have to announce the winner of last weeks giveaway, which was a skein of Dye for Yarn’s custom colour ‘Golden Beehive’. And the winner is – Christine who said ‘Red rose losing its fire’ is my favourite, I love all the colours and the names describe them so accurately’. Congratulations! We’ll be in touch to let you know how you can claim your prize. P.S. 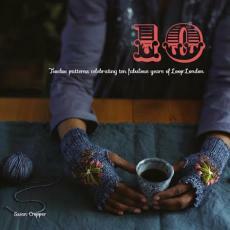 Don’t forget you’ve still got time to pre-order Loop’s 10. Place your order before 1st September and receive 10% off the price of the book. Place your order here, and please note, if you do order other items in the same transaction the entire order will be held at the shop and only dispatched when the book is available. If you wish to receive your other items sooner, please place two separate orders. Julie and Loops…an inspiration to us all! I fell in love with Julie’s family in an advertisement for LOOP.I am a doll maker and am fascinated by her concept and imagination. Please don’t stop Julie.